Precision repetition turned parts firm, Wealdpark Ltd, recently installed a MecWash Solo 400 and an Aqua-Save Junior 2 waste water recycling and coolant treatment system at its purpose built production facility in St Helens, as part of a comprehensive modernisation programme. Wealdpark has produced high precision turned parts used in a number of industries including defence, rail, aerospace, electrical, automotive, fasteners and thermo coupling for more than 40 years. Quality control is vital to the ongoing success of the business; Wealdpark operates a custom built quality inspection facility to ensure turned parts are manufactured to the most rigorous and exacting standards. In 2001 the company committed to a modernisation programme that has since seen the installation of a number of new machines including Star sliding head lathes, Miyano and Doosan fixed head lathes, a Hurco machining centre, an Absolent air cleaning system and a bespoke component cleaning system which includes the MecWash Solo. 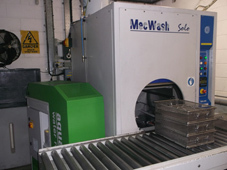 Following the decision to upgrade its equipment, Wealdpark approached MecWash with a dual requirement – it needed to ensure its turned parts were cleaned to the highest standards, but was conscious of the volumes of water used when an aqueous cleaning machine is in constant operation so wanted a system which would minimise waste. The company also specified that it works with a variety of materials including steel, brass, stainless steel, aluminium, copper, phosphor bronze, nylon and PVC, so the wash system needed to be capable of effectively cleaning all of these variants. After comprehensive trials at its purpose built lab facility, MecWash advised Wealdpark that the best solution would be to install a Solo 400, combined with the Aqua-Save Junior 2. This would ensure optimum cleanliness, with minimal water wastage. The MecWash Solo 400 can offer a number of features including spray wash, dedicated jetting (for components with blind holes or complex shapes) and a mist spray rinse which are used to effectively remove preservative oils, machining lubricants, metal swarf and chips from machined components. The system also includes a high volume hot air dry. The Solo’s versatility makes it perfect for precision engineers responsible for manufacturing a wide variety of complex components and can be used as an intermediate wash or as a final wash.
Jim continues, “We work to extremely tight tolerances where even the tiniest microns of contamination can cause a part to be rejected. Before installing the MecWash machine, Wealdpark used a rotary drum system to clean its parts, but we found that after a period of time this method was not able to provide the high quality of finish demanded by our clients. Recycling the wash water through the Aqua-Save system has resulted in less frequent emptying of the wash tanks and has also contributed to the improved cleanliness of the parts by removing coolant residue from the wash water.